I am considered a scenthound, as opposed to a sighthound and I am just a bit larger than the American Foxhound. 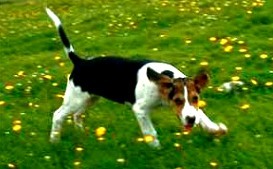 My breed was developed for the sole purpose of eliminating the English countryside of the wily and evasive fox. My early ancestors worked in packs to accomplish this goal. I am very obedient and loyal. These traits, combined with my deep, no-nonsense voice and my get-the-job-done attitude, make me an ideal guard dog. My smallish size and even temperament also make me a good choice for a household pet, even though I don�t get to do that very often. When fully grown, I am between 23 and 27 inches tall (58.4 to 68.6 centimeters) and I weigh between 55 and 75 pounds (24.8 to 33.8 kilograms). We have no English Foxhound Breeders listed at this time. Click here to place your English Foxhound Ad!